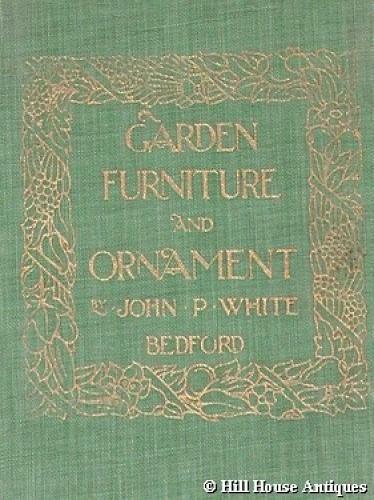 Rare original copy of John P White of The Pyghtle Works, Bedford, catalogue of Garden Furniture & Ornaments dated Xmas 1906. The catalogue is divided into sections; garden seats, tables, sundials, trellises, summerhouses, garden ornaments, pergolas, greenhouses and so on. The original boards are a bit marked and worn but the interior is in excellent condition, beautifully and comprehensively illustrated throughout. Many arts & crafts type furniture designs. Endpapers slightly damaged and foxed. Approx 112 pages. We also have an EXTREMELY scarce original copy of John P Whites Pyghtle Works catalogue of MH Baillie Scotts exclusive furniture designs for them.